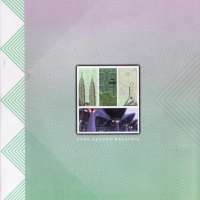 The new green RM5 denomination note issued in September 1999 depicts the "Wawasan 2020" theme of the current development Malaysian currency note series which reflects Malaysia's economic development and achievement towards a fully developed country. 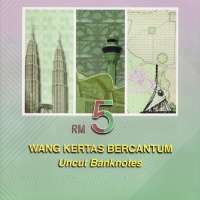 The construction sector has been selected as the design motif of the RM5 note, the fifth denomination issued in the current series (new series). 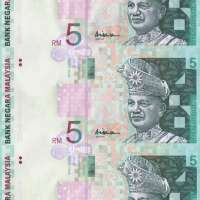 The obverse of the new RM5 note retains the dominant intaglio potrait of the First Seri Paduka Baginda Yang di-Pertuan Agong and the distinctive anticopy square in the centre of the note. The predominant design emphasises the construction sector. This is represented by landmark buildings such as KLIA, Petronas Twin Towers and a geographical map bearing the landmark symbols representing Putrajaya and Cyberjaya. 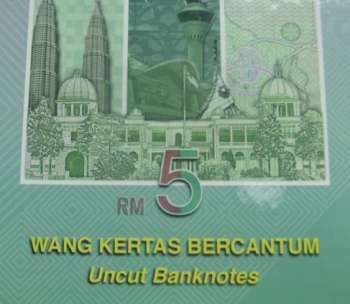 The security features in the note include the security thread with the repeated "BNM RM5" text, three-dimensional watermark potrait, anticopy feature known as "PEAK (R)" and security fibres in the paper. Signed by Ali Abul Hassan. 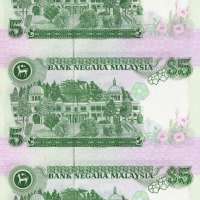 The green RM5 denomination note issued in January 1984 incorporates designs which are based on traditional Malaysian ornaments, wood-carvings, craft and flora and a vignette of a prominent building in the Federal Capital. It is the second denomination of the second series (old series). 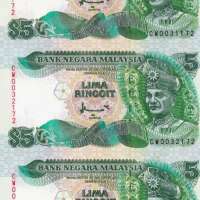 The obverse of the RM5 note bears the potrait of the First Seri Paduka Baginda Yang di-Pertuan Agong. The general background design includes patterns based on traditional ornaments, batik, wood-carvings and other crafts. 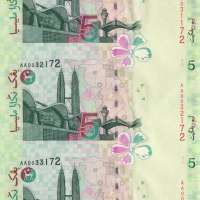 On the reverse side of the note, the predominant design is a vignette of the National Palace, one of the major landmarks in the Federal Capital. The national flower, the Hibiscus is depicted on the lower right hand corner of the note. The security features in the note include the optical security thread, the latent image of the denomination numeral "5", the see-through feature and the watermark portrait of the First Seri Paduka Baginda Yang di-Pertuan Agong. Signed by Ahmad bin Mohd Don. Standard Catalogue of Malaysia, Singapore & Brunei Coin and Paper Money.